2 ft. x 6 ft. acrylic panels Height 6 ft. with full NO GAP Living Plastic Hinges which easily attache's and hold panels tightly. Total Height 6 ft. With easy assembly instructions. Welcome to our custom Acrylic SOUND, WHISPER ROOMS, Drum booths, screen panels, for Drum sets, Drum kits and drum n bass. 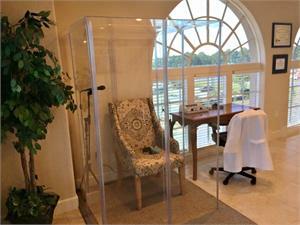 We take great pride in these enclosures and the quality of their construction. With 15 years of custom fabrication in the plastics industry behind us, we can construct any possible enclosure for your drum sets, drum kits, drum and bass, or any type of sound or noise that you need to control. Drum sets, drum kits, drum and bass sets, come in many different sizes depending on the equipment you purchase. So let the specialist at PDC help complete your drum set accessories at these great introductory prices. With acrylic drum shields for your Drum sets, you and your Drummer will be able to achieve that perfect mix and sound. If shipping to NYC we will have to charge and extra $125.00 shipping due to special trucking in NYC, shipping out of the Continental USA please call or email for a quote on shipping. I ordered this Drum Booth/ Hearing booth, last week we got it all set-up and i was amazed by the quality and how quickly we got it all put together. When we tested the sound i was surprised of the sound reduction that it made and how clean the sound sounded it was just magnificent. I recommend Pennzoni's Drum Shields they Really do work also Great quality and amazing Customer service. thank you for an awesome experience.